This week’s project is submitted by Shannon. Let’s hear what he has to say about it. “I finally got this finished. Thanks so much for your advice regarding the slick dye job. This was my second Windsor but the first that I made from tree to chair. Previously when I made one I had taken a class and the bending had already been done. The arm, bow, and spindles are made from red oak. The turnings are hard maple and the seat is made from poplar. 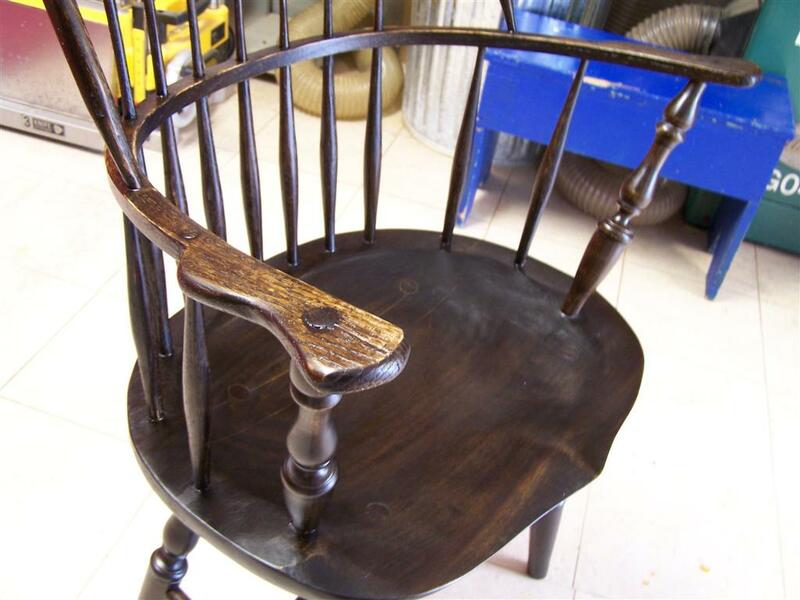 All the wood started green and the contractions as the wood dried are what make this chair built to last. Additionally all the joints are wedged for an added mechanical bite. This was my first introduction to green wood construction and my introduction to my newest favorite tool: the spokeshave. 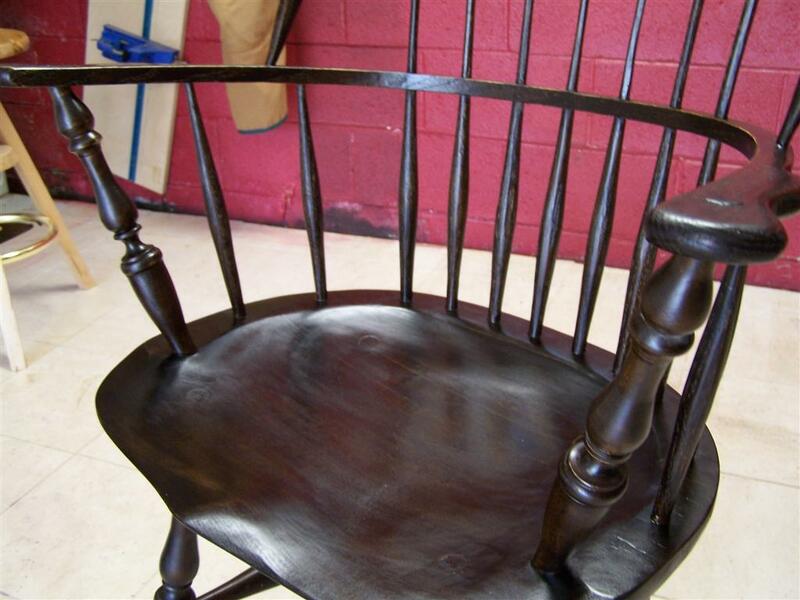 The finish process has been documented on my blog and a big thanks goes to Marc for pointing me in the direction of General Finishes water based dyes”. Can you upload larger views of the pictures? They only have the thumbnail size available. That’s a nice chair, Shannon. I’d love to try that someday. It seems a bit intimidating. I can’t wait to see your blog posts about the construction. Wow Shannon, that chair came out fantastic. 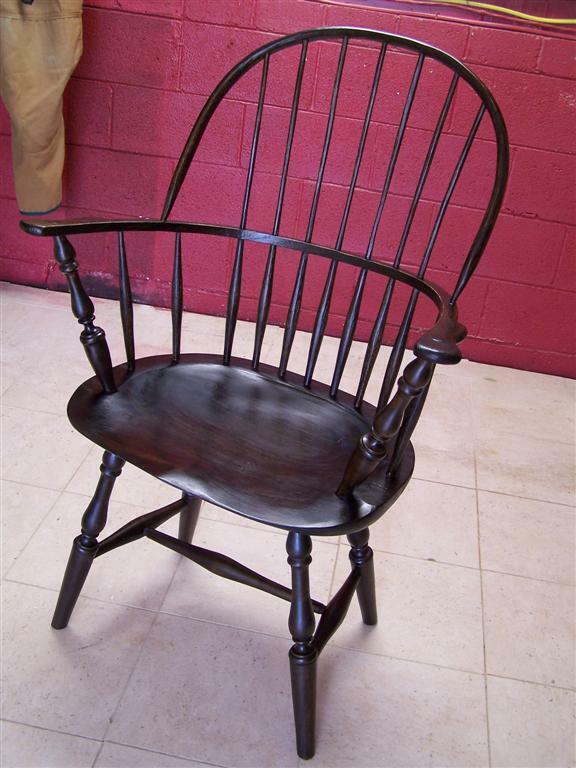 As far as I’m concerned, the Windsor chair and the Philly high boy are the two projects that really put you on the map as a serious craftsman. And when I get to that point, I think I’m going to opt highboy since I’ll more likely succeed. Your finish job is just fantastic, it looks like people have been sitting in that for 100 years. Nicely done. Guess you’ll have to build a highboy next! Great job on the chair! Chairs are definitely my Everest and have not yet attempted anything more complicated than a simple stool.